Feeling healthy and confident is something I've always wanted to work towards, but as I committed to run for Miss Boston this past weekend, I knew I had to push myself harder. Getting on stage in a SWIM SUIT in front of 300 people was quite frightening to me.... I was a child who was WAY too self-conscious to walk around the pool in a swimsuit. A towel was always a necessary companion to me no matter where I went, which was sad because I should not have been ashamed.. yet I was. One day, I finally came to the conclusion that this is MY body, the ONLY body I'll ever be given, and being healthy is the best way to treat my body and will lead to more confidence. And this process led me to feel better than I've EVER felt! 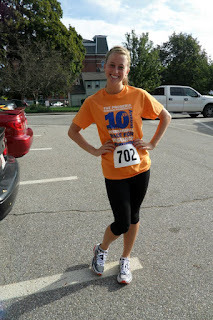 me at my first race, a 5k for Progeria research! I found a passion for running, and pushed myself to go just a little further every day. The music I jammed to through every workout reminded me of summer, being in a swimsuit, and pumped me up to strut across a stage in a bikini. I adjusted my diet to include more protein, more vegetables, and scarce sweets (although I must admit, I have a horrrrrible sweet tooth, so naturally I had to indulge a few times!). I also reminded myself that it is near impossible to look like the girls in magazines, nor did I want to look like them. I would rather be healthy and enjoy a cookie occasionally than suffer to be skinny. Pushing myself towards my goal of being "healthy" led me to feel more confident than ever, and I was ready to walk across the Miss Boston stage in my bright red bikini. So my advice: set a GOAL and PUSH YOURSELF! You CAN do it as long as you set your mind to it! I believe health is always a work in progress... there is always room for improvement, so why not start now?